We have many ways to hang a sign from a ceiling grid, or from the tile itself. There are a variety of connectors from semi-permanent to light-weight temporary clips. Choose the one that's right for the size and weight of your sign. 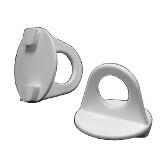 These white adhesive buttons create a hanging point on any vertical or horizontal smooth surface. They are ideal for light weight signs and tags. These black adhesive buttons create a hanging point on any vertical or horizontal smooth surface. They are ideal for light weight signs and tags. These large adhesive buttons create a hanging point on any vertical or horizontal smooth surface. They are ideal for light to medium weight signs and tags. 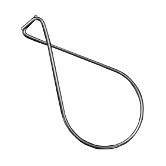 The metal loop, which forms the hanging point, can be rotated to accommodate rigid hangers. The pigtail ceiling mount screws directly into acoustic ceiling panels to create a hanging point for light weight signs. 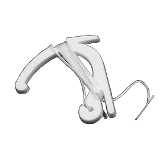 C-hooks with string are used to hang light weight signs from ceiling grids or metal conduit. 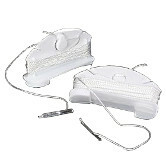 They are available in white plastic with white, black, or clear monofilament string. The string extends from the hook and the barbed end connects to your sign. These grid hangers are a simple, cost-effective means of creating a hanging point on a grid ceiling. The hangers have two connection points to fit any of our sign hanger chains, hooks, etc. They can also be clipped to other thin materials, either horizontal or vertical. Ceiling grid twist loops lock onto suspended ceiling grids with a simple twist and creates a heavy-duty hanging point suitable for large banners and posters. They can easily be removed and relocated if needed. 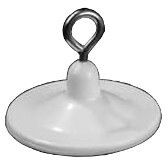 Ceiling twist-clips with string are used to hang light weight signs from ceiling grids. Six feet of white string extends from the clip and a barbed end connects to your sign. A simple twist locks the clip onto the grid securely. These two-piece ceiling bar hooks create an extra-secure hanging point from ceiling grids, They are quick to install and easily repositioned. Two-piece ceiling bar hooks are ideal for securely hanging large and heavy signs. 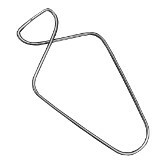 Metal figure-8 clips are an economical means of hanging light signs from grid ceilings. The clips squeeze open and grip ceiling grids when released. 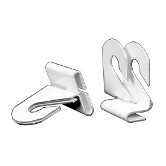 These simple, versatile clips are easy to install, remove, and reposition. Metal squeeze clips are an economical means of hanging light signs from grid ceilings. The clips squeeze open and grip ceiling grids when released. 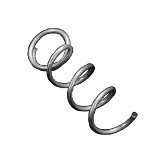 These simple, versatile clips are easiiy installed, remove, and reposition. 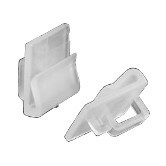 Metal squeeze-clips with string are used to hang light weight signs from ceiling grids. 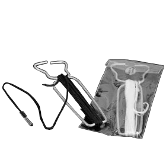 Six feet of string, in either black or white, extends from the clip and a barbed end connects to your sign. Available with white or black string.